I am a middle child and I like cookies. As a kid, when the cookies came around, there was my brother — the oldest — and my sister, the youngest and only girl, and me. I always felt like they were assured of getting a cookie because of their special birth order, while I had to work extra hard to make sure I didn’t get passed over. Because of this, I think I developed an innate sense of empathy for those who were struggling to make a go of it. This sometimes manifested as a willingness to share to my personal detriment: you don’t have a cookie? Here, take mine. While this sometimes left me without a cookie, it always left me with a friend, and usually resulted in me getting paid back in multiple cookies over time. When it comes to my work, I still sometimes find myself over-sharing my cookies, in that I want to help those struggling to figure out what to do next to the point that I have been accused of giving away my skills. My wife, our family’s CFO — and a lot of other people, actually — have told me that what I’m doing could be called “volunteer work” and it’s the wrong way to conduct “business.” As a short-term model to feed my kids, yes, they’re right. And yes, sometimes this has gone too far and I’ve gotten burned — well, let’s say singed. As a result, I’ve gotten a lot better at both saying “no” and figuring out where my limits are and clearly communicating them to people. But overall, it has taught me that there is a great value in sharing a certain amount of skills before the billing rate kicks in. 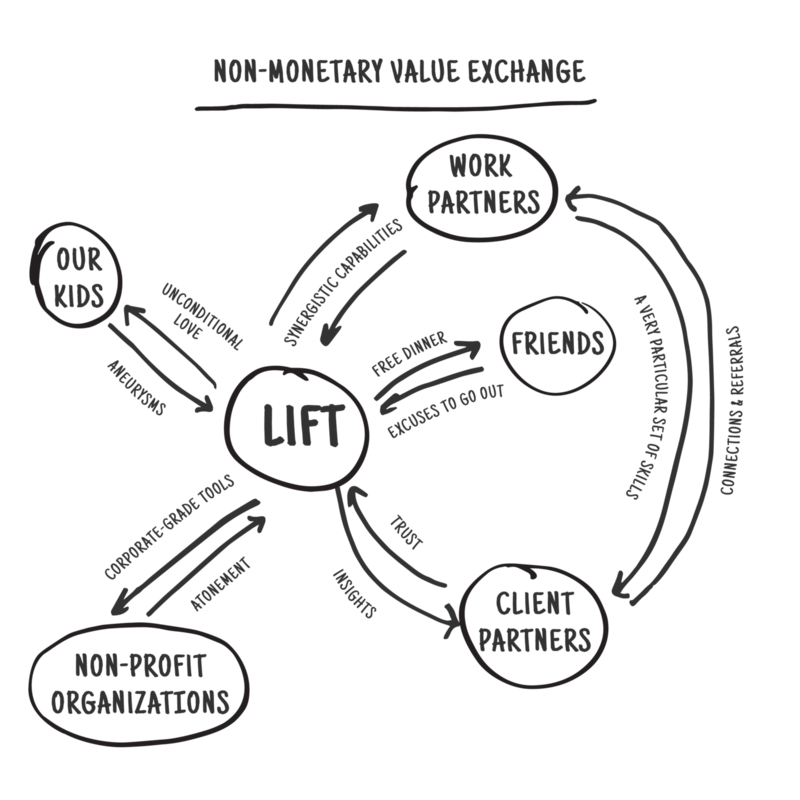 At our research, strategy and design firm, Lift Collective, we regularly give away a little bit because it costs us next to nothing while creating the context for great things to happen — it’s the long-ball version of business development. I’m not talking about giving away the farm, but sharing enough of what we’re willing to part with in order to figure out if the client / project is a good fit, to build trust and to establish a relationship, because, ultimately, your success is our success. But people need to know that they’re getting something useful for what they’re paying, and this is sometimes hard to convey in a consulting relationship. So, we offer to help first. Someone calls up and needs help defining a brand. Sure — we’re in for a strategy chat and some suggestions and loose directions. Want us to design your brand system? That’s a proposal. A longtime client partner calls and says that they need some feedback on a presentation they’re working on? Shoot it over and we’ll add our thoughts. Need to develop a communications strategy? That’s a project. A new potential partner emails and says they have a project that pays money. Definitely. Let’s meet for an hour and we’ll let you know what we think and how we might get you going, and if we’re the right partner for you (sometimes we’re not — but it’s good to find that out before it gets too expensive). While we’d still love to give our talents away for free, the kids gotta eat. And, as it turns out, people don’t value free stuff in the same way that they value paid stuff, but the free stuff sometimes helps get to the paid stuff because it builds trust. In our experience, karma has a way of evening everything out. For us, this approach has taken engagements from being purely transactional to being deeper, longer lasting, and ultimately more valuable. And we now have this huge network of really talented people that help each other. We partner on projects, refer work and resources, give advice, get beers, and make each other better at what we all do. I’m pretty proud to be a part of this group of people. So follow us. We’d like you to be a part of our network too. We’ll share our cookies. P.S. : If you want to read more about this idea, one of my friends told me to read this book called GETTING NAKED. I looked at him quizzically. He told me to calm down and that it’s not that kind of book, it’s a business book and it’s easy. Give it a read — it’s basically saying the same thing with thousands more words. Partner at Lift Collective and Toad & Tadpole. We’re a design team helping organizations figure out what to do next & make it real. Often accused of being snarky. Open to feedback. Good at trivia. Rarely called writers, serious, or “sir” unless followed by “you’re making a scene.” Stirring pots looking for good ideas.